Please excuse my giddy enthusiasm. I can't help myself -- I feel such um, well...*joy* that a certain TV show, namely "Glee" got yanked from next month's Macy's Thanksgiving Day Parade. I so despise that show, the thought of those cheesy whatsits gunking up the fabulousness that is the Macy's Thanksgiving Day Parade makes me nauseous. The annual NYC mega-balloon walkabout is broadcast on NBC -- "Glee" airs on rival Fox so obviously someone at NBC leaned heavily on the parade's organizers for allowing the all singing & dancing geekarama to be scheduled for a turkey day appearance on THEIR network. "Glee" got its marching orders, and NBC is a happy camper. I couldn't be happier. I'd much rather see a Jimmy Fallon float anyway! And while we're chatting about who's in, who's out... rumour has it that the Pillsbury Doughboy got an invite to this year's festivities, while return engagements are set with new balloons for Mickey Mouse, Ronald McDonald & Spider-Man. Spidey's balloon was a parade favourite, having flown through the streets of Manhattan for twelve consecutive years until his balloon retirement in 1998. Welcome back, web man! 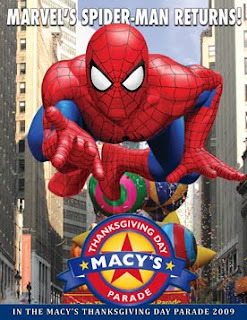 One of my wishes in life: To see the Macy's Thanksgiving Parade. It's worth the trip, Sarah. Last year was my first time there and it was everything I thought it would be. Would love to go again.